An SSL certificate is required when you enable this option. In order to test this functionality, we have included a self-signed certificate with Syncrify. A self-signed certificate is not trusted by any browser and therefore, you will see a warning message regarding the certificate. Every browser displays this warning differently. Click here to see warning messages displayed by different browsers. In order to avoid getting this warning message, you need purchase an SSL certificate from a certificate authority. Refer to this documentto see how to install a purchased certificate in Syncrify. If you can work with the self-signed certificate, you don't need to do anything. 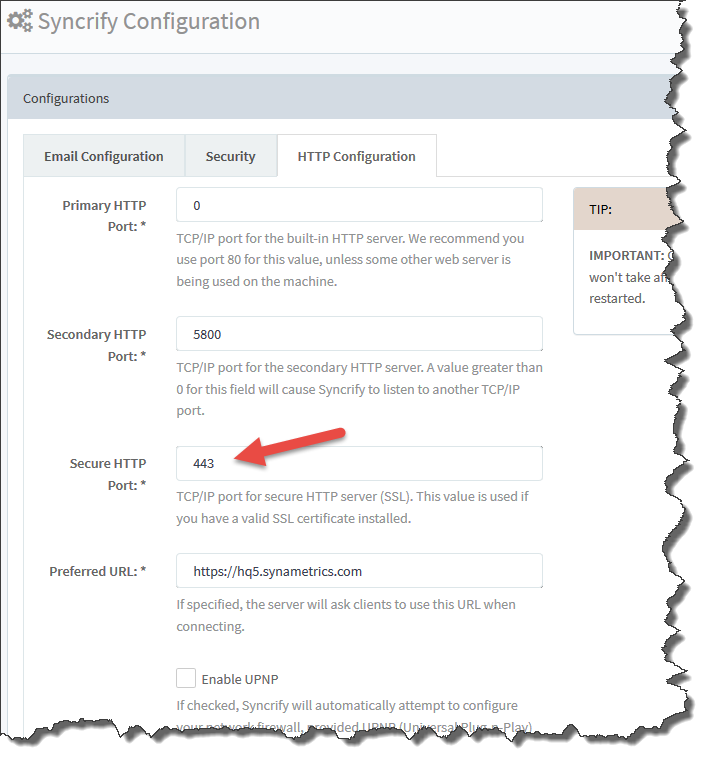 Simply set the HTTPS port from -1 to a positive value, such as 443 and restart the Syncrify. It will automatically download a self-signed certificate. When you use a self-signed certificate in Syncrify, the browser cannot guarantee the website's authenticity, which corresponds to the first problem mentioned above and as a result, you see the warning messages. It does encrypt all the data between client and server. Therefore, it may be acceptable to see this warning message if you are using Syncrify within your company or in a home environment where you want to encrypt files when uploading or downloading but don't care about forgery since the server is in your control.